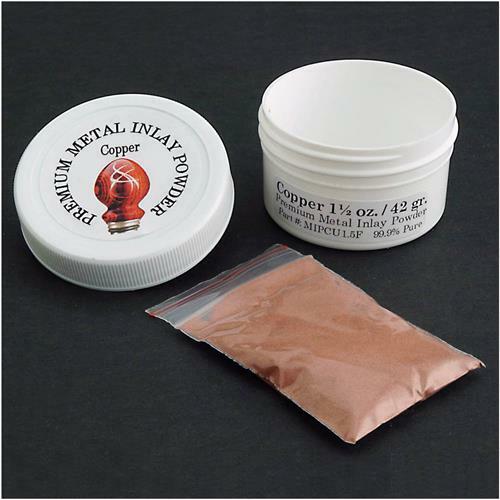 Copper Premium Metal Powder Inlay, 1-1/2 oz. Grizzly T25492 - Copper Premium Metal Powder Inlay, 1-1/2 oz. Premium Metal Inlay Powders are available in copper, brass, aluminum, and bronze. These powders will give you a shiny metal inlay in your turned or flat wood projects. Perfect for use in carved or laser engraved motifs, great for disguising cracks and blemished wood. See the T25309 Metal Inlay Techniques DVD to learn how best to use these powders and give shine to your projects! 1-1/2 ounce size of the copper powder.